Liverpool got the point they needed to return to the top of the Premier League but were left frustrated after failing to break down a Manchester United side ravaged by injuries. United lost Ander Herrera, Juan Mata and Jesse Lingard to injury in the first half - but Liverpool struggled to create chances. Jurgen Klopp's side are one point clear of nearest challengers Manchester City with 11 games to go, while United slipped from fourth to fifth in the table despite a battling performance. Elsewhere, Arsenal beat Southampton 2-0 to climb above United in the table and increase their chances of qualifying for the Champions League. Southampton remain in the relegation zone, one point from safety. Read what happened at the Emirates Stadium here. More from Ole Gunnar Solskjaer about Manchester United's mounting injury problems: "We have lost a few with muscle injuries and hamstrings. "We have some god kids coming through and I will have 11 players on the pitch against Crystal Palace on Wednesday." Southampton manager Ralph Hasenhuttl, speaking to BBC Sport: "They were much better and played very simple and we had problems to defend which is why we switched and changed the shape. "We had a few chances but Arsenal also did too. If you are 2-0 here then its easy for Arsenal. The good thing is we didn't collapse. We didn't, but we deserved to lose." Arsenal manager Unai Emery, speaking to BBC Sport: "We deserved to win. We got the chances and we played very well. "The second half was maybe an under-performance from the first but I think also we deserve another goal. "The most important thing is the three points at home with our supporters. "We are thinking it's a good step and it's game by game. Now we are happy, we are at the moment in this position and we carry on." More from Liverpool boss Jurgen Klopp, speaking to BBC MOTD: "You have to take it. I am not overly happy but we need to work with it. The next tough task is waiting on Wednesday. On Roberto Firmino's injury: "Hopefully it's nothing serious." On United making changes: "That is the quality of the United squad. You change five times before the game and in it - then you still have Romelu Lukaku, Alexis Sanchez and Marcus Rashford up front. "But Alisson was at least 100% awake to make that excellent save. Lets try again on Wednesday." Liverpool manager Jurgen Klopp has given an update on striker Roberto Firmino's ankle injury. The Brazilian has left Old Trafford on crutches. Klopp said: "It is his ankle. First he said he could carry on, then that he couldn’t. I don’t know exactly the extent of the problem." Arsenal goalscorer Henrikh Mkhitaryan: "The connection was good between the players and we were unlucky only to score two goals but that's football. "It doesn't matter if we already score two - we wanted to score more and make the fans happy. "We need it, it's a very important three points and now we must be focused on Wednesday against Bournemouth. We're still in the race and we'll fight until the end." Magnificent by United. Matic out, Martial out. Three changes forced by injury in the first half, yet solid and came closer to scoring than Liverpool. Ole isn't just smiles and niceness. SMS Message: Even though Liverpool are playing badly they still aren't losing. They only have Everton away and then they have 2 big games at home. Man City still have to go to Old Trafford. from Liam in Dronfield. Even though Liverpool are playing badly they still aren't losing. They only have Everton away and then they have 2 big games at home. Man City still have to go to Old Trafford. Jurgen Klopp, speaking to BBC Match of the Day: "We might feel like we won a point or lost two. We started exactly how we wanted to start. The injury crisis then started. Roberto Firmino then went down. "We were without chances - only United had one big one when Alisson made an excellent save - the rest were set-pieces. It kept the game open but we didn't create enough and that's the truth. "We didn't do well to be honest. We take that. It is a point gained because we have one more than before but it doesn't feel like that. "These games are always opened up by one situation. The boys didn't feel okay. I could see it in their faces. It was strange. I was thinking 'what is gong on here today'. They lost momentum and rhythm and couldn't really get it back. 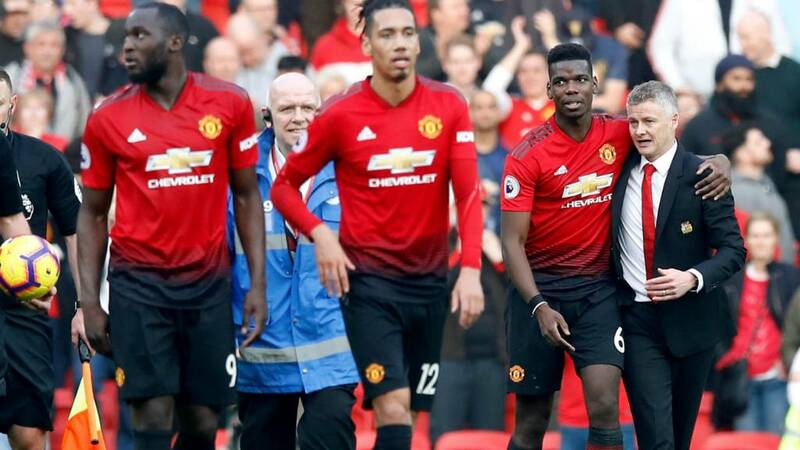 Manchester United have dropped one place in the table - despite a spirited performance against Liverpool. Arsenal's 2-0 win over Southampton means the Gunners move up into fourth - and have one point more than United. The race for a Champions League spot is almost as exciting as the race for the title. "I can't remember Liverpool having a chance. Even though they had possession, I can't remember David de Gea making a save. "Scott McTominay was excellent. When they need a goal and they take Mohamed Salah off you know Luke Shaw has played a good game." Manchester United may have dropped out of top four but this feels like another day when Ole Gunnar Solskjaer has taken a major step forward to getting the manager's job full-time. He organised a team decimated by injuries and thwarted every attack Liverpool had. United have pledged not to make a decision until the end of the season but it would be a tough call now to take it away from him. Liverpool boss Jurgen Klopp, speaking to Sky Sports: "It was a strange game. We started really well. All the injuries in the game obviously cost us rhythm. It happened to us with 'Bobby' and that was a catastrophe. "United played with a completely new midfield and three up front. We lost our rhythm and couldn't get it back. "It was a game without a lot of highlights - it was intense. On days when United are beatable you have to do it and we didn't do it. "We have a point more and Wednesday is out next game." Liverpool are fast turning into draw specialists. This is their fourth in the past five games in all competitions. Next up? Seventh-placed Watford at Anfield on Wednesday. Surely that's a must-win? At the start of the game I would have taken a point away at UTD, but that performance from Liverpool is worrying. If we want to be champions then we cannot play like that again. Average. Manchester United keeper David de Gea has now kept 100 clean sheets in the Premier League. Liverpool fans don't seem too upset their side have failed to beat injury-hit Manchester United. Chants of 'We're top of the league' and 'Allez, Allez, Allez' are echoing around Old Trafford. Liverpool's James Milner, speaking to Sky Sports: "A clean sheet is pleasing because it's not an easy place to come. We didn't get many chances as we would have liked and we're disappointed not to win the game. "Hopefully it's a good point come the end of the season. i just don't think we were good enough with our movements or final ball. "United are a confident team and well organised. There's a long way to go. "We have to look where we can improve when we have got the ball." Dogged and resilient by United. No cutting edge from Liverpool.